Personal Subaccounts allow you to set aside funds for major upcoming events, like summer camp, as well as segregate donations for an Eagle project from a scout's personal funds. Transition to 2016 Rank Requirements with a new function that transfers completed requirements from the old version to the corresponding requirements for the 2016 version of each rank. Upload TroopMaster Individual History With One File. You may now transfer advancement data with just the version of the report that shows the 2016 requirements. Cub Scouts - Upload Adult Leaders From PackMaster™. 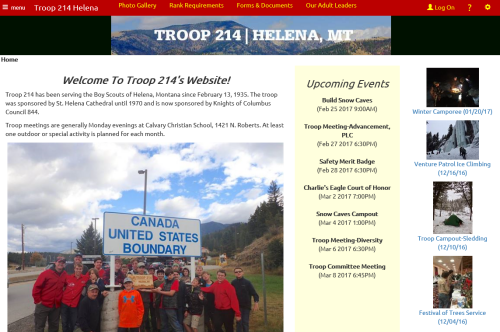 Troop 214 of Helena, Montana! Their colorful home page is just the start. Troop 214 created eight custom pages focused on every aspect of advancement, both from the perspective of scouts and their adult leaders. Scouts can learn the details of rank advancement and how to earn merit badges, while adults can find the forms to become merit badge counselors. Is Your Troop A Possible Winner? Don't be shy! If you would like your site to be considered for Website of the Month, please let us know at CustomerSupport@TroopWebHost.com!